At the time of this post Athene’s channel has been live streaming on Twitch for 567 hours and for pretty much the whole duration of the stream his viewer count hasn’t ever dipped below ~7k. This is already quite questionable and viewers have also began to realise that for a stream with 7k viewers the chat moves EXTREMELY slowly. We’re talking like 1 message every 5-10 seconds the majority of the time and then half of the actual chat is just people spamming “MrDestructoid” or “Viewbots reporting”. We then also had Twitch Bot Detector @BotDetectorBot tweet something very interesting. An example of the stream chat on twitch. 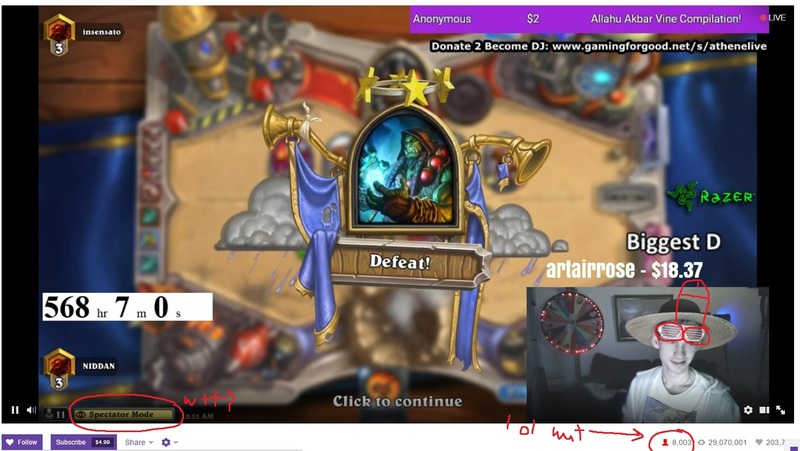 Look at the timestamps, in over 2 minutes that chat couldn’t even clear the screen (7k viewers wtf?). On top of this the whole stream is a literal cringe fest with no actual gameplay, just some guy (who isn’t even Athene) dancing to crappy dance music whilst spectating another random guy play Hearthstone.